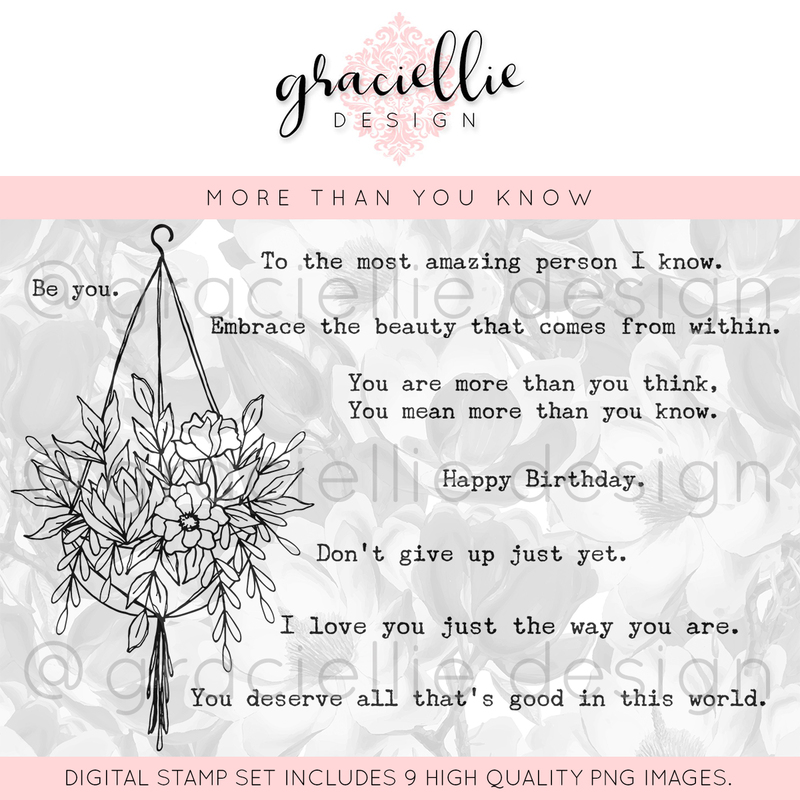 Shoregirl's Creations: You are more than you think! 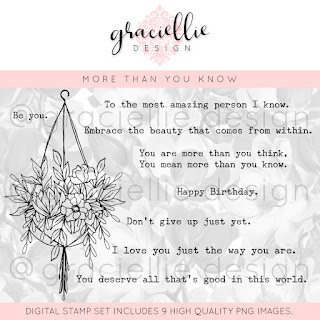 Today's card features Gracie's new "More than You Know" digital stamp set. The sentiments of this set really spoke to me as someone who has long struggled with being insecure about my work. They remind me that my worth doesn't come from how talented or creative I am, how big my Instagram following is, the number of comments on my blog post, or whether or not I'm part of a particular design team....but rather from things that come from within like kindness, generosity, patience, love etc. Be You! -- You are more than you think! As you can see I printed off extra flowers and made my hanging basket explode with vibrant color. I also popped up there of the blooms with mounting tape and inverted the color on my sentiments to make them stand out from the card a bit more. Gorgeous card and beautiful message, everyone needs to here this! Beautiful write up also, thank you. That's a most beautiful hanging basket image Esther, coloured to perfection and placed perfectly against the window making a lovelt card and s Sandra said a lovely sentiment as well. Thanks so much for joining us at Stamping Sensation 'All thinks Bright and Beautiful' theme. What a beautiful, very colourful card Esther!I love all the layers and texture too. Thanks for joining us at Stamping Sensations. Beautiful card and the sentiment is perfect - it's a lovely set. Such a pretty card, bright bold love it, The embossing is wonderful too. Thanks for playing our twist challenge at Krafty Chicks. my goodness, this is stunning! This is just STUNNING! I love every inch of it! Those fussy cut flowers are divine and your colours! Just glorious! What a beautiful card. Love your awesome coloring and the layout. Thanks for playing along with us at Make My Monday. Looking forward to seeing your creative projects in the future galleries again.